You had better not park here on Tuesday mornings. NEWPORT BEACH, CA — Once a month or so in Albany, a truck comes around to sweep the streets and especially the gutters. But it can’t do its job thoroughly because parked cars are in the way. So, slalom-like, the truck weaves in and out of the parking lane, leaving debris where cars are parked. This could easily be fixed if only the city wanted it fixed. Here in Newport Beach, they don’t have this problem. 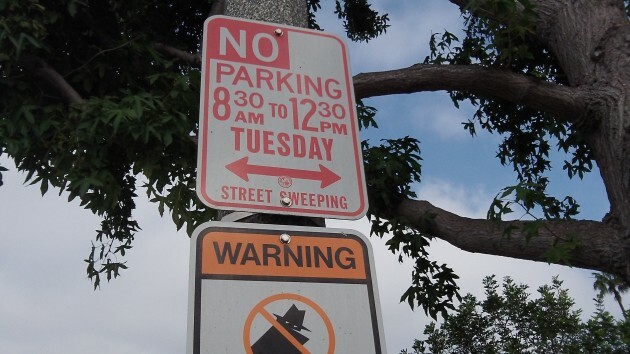 Signs remind people that parking on the curb is banned during certain hours of the week so that street cleaning can take place. Note that this is done weekly, but that’s because it’s a bigger place with more people and presumably way more money than a little town in Oregon has. But what it also has is clean streets. It’s not as though parking is easier to find here. In fact it’s harder because off-street spaces are not as plentiful as they should be for a densely populated place. So residents and visitors put up with a little additional inconvenience in order to make sure the streets are properly and regularly cleaned. Maybe if the citizens knew exactly what day the sweeping would take place, a few more might park elsewhere? Things seem to be better lately, but in the past, sweeping would often take place the day after garbage pick up and there would still be a lot of carts in the street. That brings up another pet peeve of mine. People that have their carts in the street several days before/after pick up. It seems some of them only remove their carts to refill them the day before pick up. Same thing goes on in Oceanside, with stiff fines for those who don’t make sure their vehicle is out of the way. Isn’t all this eliminating parking a lot like reducing highway speed limits to 5 miles per hour to make it totally safe; thus subverting the purpose for the highways in the first place. The purpose of the street is for people to use in their transportation (including parking), not to keep the street pretty and neat. Not that the no-class yahoos who leave their trash cans out or their backstops in the street aren’t aggravating, but I don’t have a right not to be aggravated. Streets are for cars, not for sweeping. On my city street the before and after doesn’t look much different, so what’s the point? The best solution is for residents and property owners to avoid this cost and voluntarily take on the responsibility of keeping junk off the streets. I do this and see it happening with others in my area. But some folks, however, say they pay the city for the service so why bother being a good neighbor? Hopefully the City of Albany doesn’t resort to exercising its coercive police power through street cleaning tickets. This is a city government eager to take more money from its residents. So who would enforce the “NO Parking” I see abandoned cars, trailers, illegally parked, etc and they stay that way. A schedule of street sweeping days and locations is published and sent to residents every year, so “not knowing” is not a valid excuse. Come on, take individual responsibility for a change. Move your junk; you probably have a drive way.